Sometimes, sometime, or some time? Hello students! It’s Shayna, your teacher from EspressoEnglish.net and today I want to clear up some confusion around the words sometime, sometimes, and some time. Are they all the same? No! These words have different meanings and uses. Let’s start with sometimes. This is an adverb of frequency, meaning it describes how frequently something happens. Sometimes means it happens on certain occasions, but not always. Sometimes I drive to school, and at other times I take the bus. His English is pretty good, but he sometimes makes grammar mistakes. When the weather is nice, we sometimes have a picnic by the river. Sometimes is typically used with the simple present and simple past. It can be placed immediately before the main verb, or before the subject: Sometimes I drive to school / I sometimes drive to school. It can also be used at the end of the phrase: I drive to school sometimes. We should go out for coffee sometime. He’d like to talk to you sometime. Let’s get together sometime soon. I’ll call you sometime this afternoon. She quit her job sometime last year. Sometime is placed at the end of a phrase, as in the first two examples. When it is used like this, it means “in the future.” It can also be used in the structure sometime + a time period: sometime this week, sometime next year, sometime yesterday. When it is used with a time period (this afternoon, last year) then we can see from the sentence whether it is referring to an unspecified time in the future or past. Every evening I spend some time relaxing in the bath. He did volunteer work for some time in college. It will take some time to finish this project. We don’t say how long the period of time is – it might be an hour, a couple of weeks, or a year. Some time can be used in the past, present, or future, as you can see from the three examples. Can you make your own example sentences with all three? It’s important to put what you’re learning into practice! My English courses can help you do that – many of them have quizzes and practice exercises, and in some cases you can send me your answers for correction. 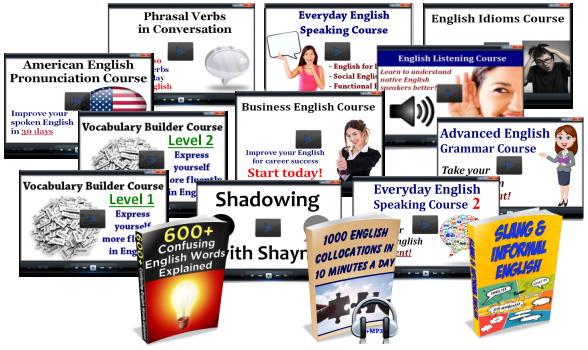 Get more than 400 English lessons to help you improve all your skills!